In this video Jim Hansen provides a “video abstract” of his latest — and longest — paper, Ice melt, sea level rise and superstorms: evidence from paleoclimate data, climate modeling, and modern observations that 2 °C global warming could be dangerous, published this week after a lengthy period in review. He, and his stellar list of co-authors, have also provided an “abbrievated” version of the paper, which I strongly recommend you read. My abstract is a bit shorter: fresh water from melting ice sheets in Greenland and Antarctica is beginning to change the way that heat moves around in the global ocean, setting up feedbacks that will melt the ice faster. This in turn will lead to much more rapid sea level rise than suggested in the recent IPCC report, and much bigger temperature contrasts between warm and cold oceans in the North Atlantic and around West Antarctica — which will drive the mid-latitude superstorms of the paper’s title. Not a pretty prospect. And if you think it’s unlikely, consider this. There are already “cold blobs” in the North Atlantic and off West Antarctica, Atlantic storms are becoming much more vigorous , and there are hints of an acceleration in the rate of sea level rise. Hansen has been right before. I hope, for all our sakes, that this time he’s not. New Zealand’s merry little band of climate deniers are turning out to be a right bunch of Cnuts. Sea level rise and its implications for Christchurch and the wider world have been making news in recent weeks — as have new projections of rapid sea level rise over the remainder of this century. So what does a good climate denier do? To stay faithful to their core belief — that climate change isn’t happening, or isn’t going to be bad — they have to argue against policies designed to deal with its impacts, as well as those intended to cut carbon emissions. Sea level rise? Like Cnut, they line themselves up against the waves. 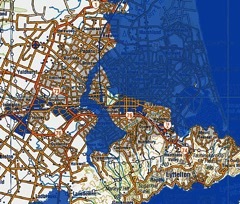 I’ve blogged many times on the challenge sea level rise poses for post-quake Christchurch. The 2011 quakes caused large parts of the city to drop by up to half a metre — effectively delivering decades of sea level rise in a matter of minutes. For some areas of the city tidal and run-off flooding are now commonplace. The current debate on sea level issues has been prompted by the city council’s long term planning process — which recommends1 that development should be restricted in areas where future sea level rise is expected to cause problems. Not surprisingly, this has some owners of coastal properties concerned that they will lose out. The council has also looked at the idea of building a tidal barrier across the Avon-Heathcote estuary to protect the city. Local politics and property owner self-interest is bumping into the harsh realities of climate change, leading to a wide variety of responses — including “it isn’t happening”. The political distraction, of course, has been the response to Nicky Hager’s book, Dirty Politics. I haven’t yet read the book — it’s queued up on the iPad — but as everyone now knows, it concerns the sordid activities of right-wing attack blogger Cameron Slater, and in particular his close ties with senior government politicians. Slater has a long record of climate denial — often lifting material from µWatts or the Daily Mail to support his ignorant bluster — but the revelation that he published paid material for PR companies masquerading as his own opinion begs a question: was there a similar motivation for his climate denial posts? According to Waikato University’s Willem de Lange and freelance climate denier Bob Carter, the whole Arctic is cooling strongly. When Bill and Bob plagiarised their own work for the Heartland-funded and published Non-governmental International Panel on Climate Change (NIPCC) second report, they were not just copying their own words, but also plagiarising earlier efforts by the NIPCC and Craig Idso’s Centre for the Study of CO2 and Global Change. In fact, a 2007 misrepresentation by Idso of a 2004 paper about temperatures up to the 1990s in a single Greenland fjord has been handed down through seven years, successive “authors” and NIPCC reports until it has become an unbelievable lie that de Lange and Carter are happy to repeat for a new audience. Regarding the Northern Hemisphere, the Arctic regions have been cooling for the past half-century, and at a very significant rate, making it unlikely Greenland’s frozen water will be released to the world’s oceans anytime soon. This temperature trend is just the opposite — and strikingly so — of that claimed for the Northern Hemisphere and the world by the IPCC. Accompanying the cooling, the annual number of snowfall days over parts of Greenland has also increased strongly, so an enhanced accumulation of snow there may be compensating for the extra runoff coming from mountain glaciers that have been receding. Source: NOAA’s annual Arctic Report Card, 2013 update. So how on earth do they justify a claim that the Arctic has been cooling “at a very significant rate”? The answer’s simple. They don’t. There is no supporting reference given for that statement. It is offered as a conclusion without a hint of a reason supplied in the text above it, or in the references below it. But Bill and Bob didn’t just make it up, they stayed true to form and copied it word for word from somewhere else. Bad Behavior has blocked 3076 access attempts in the last 7 days.